acrylic on canvas • 40" x 30"
"Hooded" was reproduced on the cover of "Sacred Expressions"
Painting response This is my favorite... 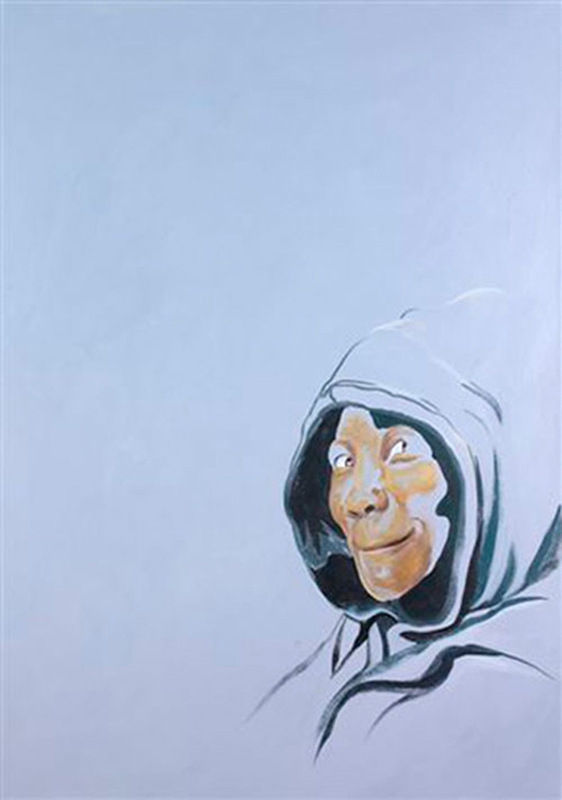 The face, leering out from the depths of a covering hood, which would from almost any other spatial perspective make the face invisible, and blend, like the hood, into the background, discloses a mischievous and wicked face, smiling, but almost ape-like. It is not an evil face, because it contains a smile and a cheerful glance, which is why I think mischievous and wicked are appropriate, since in addition to the underlying negativity, these terms are associated with humour and enjoyment as well as evil. My reflections are that the hood, like a mask, covers the character whose features disclose much that the hood covers. The safety of the invisibility of the figure protects him from full exposure that might bring about rejection and concern.